The Text Mesh generates 3D geometry that displays text strings. You can create a new Text Mesh from Component > Mesh > Text Mesh. Line Spacing How much space will be in-between lines of text. See in Glossary Which point of the text shares the position of the Transform. Alignment How lines of text are aligned (Left, Right, Center). Tab Size How much space will be inserted for a tab ‘\t’ character. This is a multiplum of the ‘spacebar’ character offset. Font Size The size of the font. This can override the size of a dynamic font. See in Glossary style of the font. The font needs to be marked as dynamic. Rich Text When selected this will enable tag processing when the text is rendered. Font The TrueType Font to use when rendering the text. Color The global color to use when rendering the text. See in Glossary. To make generic 2D text for GUIs, use a GUI Text component instead. Select the imported font in the Project View. Choose GameObject > Create Other > 3D Text. You have now created a text mesh with your custom TrueType Font. You can scale the text and move it around using the Scene View’s Transform controls. See in Glossary’s foldout. If you forget to set the texture then the text in the mesh will appear blocky and misaligned. You can download free TrueType Fonts from 1001freefonts.com (download the Windows fonts since they contain TrueType Fonts). If you are scripting the Text property, you can add line breaks by inserting the escape character “\n” in your strings. Text meshes can be styled using simple mark-up. See the Styled Text page for more details. 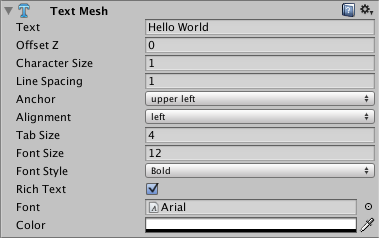 See in Glossary, it’s possible that if the size of the TextMesh and font texture differ the TextMesh will look wrong.